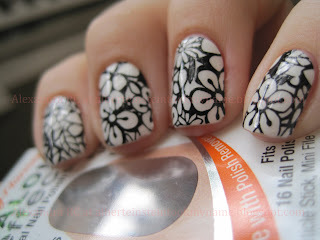 Sparkly Vernis: Sally Hansen Salon Effects Cut it Out, black and white flowery fun! 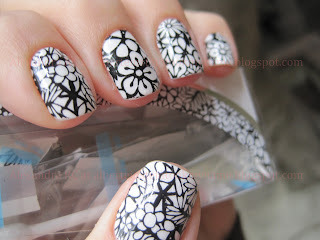 Sally Hansen Salon Effects Cut it Out, black and white flowery fun! I didn't want the year to pass me by without trying these. I found them super easy to apply, and it's true what they say, you can get 2 manicures out of one packet. However, I only got one because I opened the first packet just "to see them" and the next day they were useless :/ They fit really nicely! and I would definitely try it again. This trend quickly caught on in 2011, although I was hessitant at first, I'm glad I took the plunge. This is such a cute design. I have a package of the leopard stickers but I haven't tried them yet! I'm saving them for a vacation or something. I like this one but whenever I see it I want to color it in! @ Laura: I know what you mean, I thought about it, and also about adding rhinestones to the centers.